Welcome to TickPick’s Neyland Stadium Seating Chart. Here we will cover everything you need to know before purchasing Cheap Tennessee Volunteers Tickets, including seat views, student sections, premium seating, tailgating, and more. Neyland Stadium, home to the Tennessee Volunteers, is located in Knoxville, Tennessee. Neyland Stadium, named after longtime head coach Robert Neyland, began construction on March 21st, 1921 and was completed six months later on September 24th, 1921. After almost one hundred years worth of expansions and renovations, the stadium went from originally holding 3,200 fans to now upwards of 102,000. Neyland Stadium is the fifth largest stadium in the United States and sixth largest stadium in the world. The vast majority of seats at the stadium are bleacher seating, meaning no chairbacks. The only sections that do have chair backs are in the East and West Club sections and in the Tennessee Terrace, sections T1-T7. More on that below. The Tennessee Volunteers have a huge student section, including sections D-K . SEC football is the rowdiest in the country, so these sections will be the life of the party at Volunteers games. If you are bringing kids to the game, we would advise steering clear of sections adjacent to these as well. Student tickets sell out quickly since only a small portion are allotted to the student body. More importantly, you won’t be able to purchase student section tickets on the secondary market as only currently enrolled Tennessee students are eligible for these seats. The Tennessee Terrace club seating is located in sections T1-T7. These sections include chair backs, food and beverage options, and access to an air-conditioned concourse. These seats provide some of the best views throughout the stadium for in-game action. The East and West Club seats at Neyland Stadium are located directly below the sideline skyboxes. Much like the Tennessee Terrace, these seats include chair backs, food and beverage options, and are under cover from the elements. An added feature to these seats are they include pre-game and halftime buffet tickets. Neyland Stadium scatters the visiting teams fan sections throughout the venue. Sections A-B, GG-OO, and Z13-Z15 are the designated visiting team sections. With all these sections, please keep in mind that they are divided in half for home and visiting fans. If you are fan of the opposing team and want to sit ensure you sit with your fellow fans, this is where you want to be. If you are a Volunteers fan, make sure you avoid these sections! 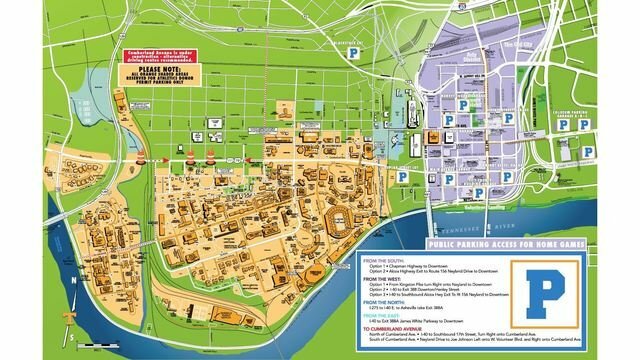 This is a detailed map of the designated parking areas near Neyland Stadium. Anything colored in orange requires a parking permit, while any lot labeled with P is designated public parking. Most lots directly surrounding the stadium are designated lots that require a parking permit. If you do not have a parking pass please refer to any lots that are listed as general parking. There are several general parking lots near campus, so there are options. Fan tailgating is allowed in the lots surrounding the stadium starting at least five hours prior to kickoff. As cliche as it is, there really isn’t a bad seat at Neyland Stadium. You can feel the energy of the crowd from all corners of the stadium. But, like any football stadium, the best viewing will come in the sections between the 30 yard lines. Remember, TickPick does not charge service fees, so if you haven’t secured tickets yet check out our Cheap Tennessee Volunteers Tickets!